With variable food security, uneven water and sanitation infrastructure, fragile health systems, and a range of socioeconomic challenges, Sub-Saharan Africa is particularly vulnerable to the health risks of climate change. Key risks such as undernutrition, malaria and diarrheal diseases – already leading causes of morbidity and mortality – are likely to grow as temperatures warm and rainfall becomes more variable. Climate change is already having a significant impact on Sub-Saharan Africa, threatening efforts to meet the growing needs of the most vulnerable. Temperatures have increased by over 0.5°C or more during the last 50 to 100 years. The increase in extreme weather events such as droughts, floods and cyclones is well documented. While claiming lives, these events also foster undernutrition and catalyze outbreaks of diseases such as cholera and viruses.Their continuing likelihood is a certain impediment to development. Current evidence also shows that the ranges of some species and ecosystems are shifting due to elevated carbon dioxide and other climate change drivers, with significant implications for the incidence of malaria and other diseases. The situation is compounded by a complex variety of underlying physical, social, economic, political and cultural forces and trends operating on local, national and international scales. This report* presents evidence on the impacts of climate change risks on the health sector in Africa. It illustrates climate threats to health and development investments and highlights opportunities to achieve health targets in Sub-Saharan Africa in the face of climate change. Included in the report is information for health specialists on the basics of climate projections for Africa, climate change and health vulnerability basics for climate specialists and, details of health risks (i.e. undernutrition and vector-borne diseases), response opportunities (i.e. policy response and frameworks for action), as well information on future efforts, including current gaps in knowledge and capacity on health and climate. *download the full report from the right-hand column. The key messages (taken from the Executive Summary) are provided below. See the full text for much more detail. This report is also available in French and Portuguese. From page 3 of the report. In summary, the evidence presented in the report on the links between health and weather and climate paints an increasingly detailed picture of likely declines in health across Sub-Saharan Africa, with regression on health indicators, an increase in the burden of undernutrition and disease, and, ultimately, a growing number of people at risk of poor health outcomes. The key conclusion of the report is that a two-fold task of understanding climate impacts on human health and integrating this information into decision-making is necessary to increase resilience of health systems in Sub-Saharan Africa. Climate change threatens progress on health and development investments. Over the last two decades, many African countries made significant progress in reducing child mortality, increasing life expectancy, managing food security risks, and strengthening health services and systems. Climate variability threatens to reverse those gains and trigger growth in the disease burden. In particular, the major strides made in reducing malaria, cholera and meningococcal meningitis may be lost as the corresponding vectors or pathogens respond to anticipated changes in temperature and precipitation. With climate change, Africa’s leading health challenges are likely to persist and even grow, resulting in declining outcomes. Undernutrition, and stunting in particular, will continue to be a pressing concern. Staple crops such as maize and wheat are currently growing at their thermal tolerance; potential temperature increases may reduce yields and increase food insecurity. In addition, the increasing use of less nutritious, short-cycle crops, coupled with high levels of carbon dioxide in the air, may reduce the availability of nutrients in crops, catalyzing an increase in micronutrient deficiencies. 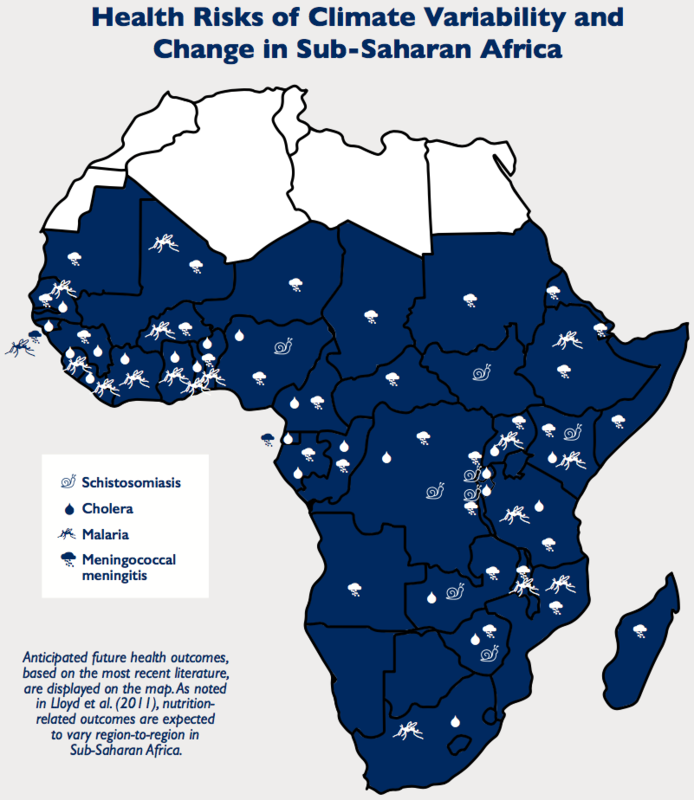 Malaria’s range is likely to expand, putting more people at risk. Changing temperature and rainfall patterns could make more regions suit- able to malaria, with the greatest increase in dis- ease prevalence likely in highland areas, where resistance is low. Certain lowland areas, however, may see less malaria. Dengue fever, frequently misdiagnosed as malaria, may become more prevalent. The anticipated risk is unevenly distributed and more widespread than previously suggested. Increasing urbanization exacerbates the complex biological and environmental factors that will in uence its distribution and prevalence. Heat stress is a growing concern, with significant mortality possible depending on factors such as age and overall health, but with children and older people at the greatest risk. It is also likely to have negative socioeconomic effects, such as decreased worker productivity and lower incomes among those whose livelihoods de- pend on crops and livestock. The close association of disease outbreaks with weather conditions – such as heavy rainfall or persistent winds – adds urgency to the need for investment in systems linking weather and climate forecasting to health early warning. ​Cholera, a leading killer of children under 5, may be a priority for such an early warning system, as incidence appears to be associated with warming events and low precipitation – likely climate change outcomes in many regions of Africa. Evidence remains inconclusive on whether climate change will increase the severity of El Niño Southern Oscillation (ENSO) events, but further study should be a priority as strong El Niños and La Niñas may be associated with outbreaks of cholera, Rift Valley Fever and meningococcal meningitis. In many countries, preparation in the health sector is lagging; more national and international support is needed. The countries expected to experience the greatest increases in climate-driven health outcomes are also those whose health systems have the least capacity to manage additional challenges. Regions with the triple combination of high exposure to climate change impacts, extensive poverty and dense populations are likely to face a major adaptation challenge. Malawi, Mozambique, Zambia, Zimbabwe and the Lake Victoria region in East Africa are examples. Whether these risks become realities depends on the level of preparedness of national ministries of health, health care systems and health care professionals, together with the public’s awareness of the risks. Currently, these agencies, institutions and individuals are not planning systematically for the specific effects of climate-induced challenges. International frameworks set global standards for decision making. These include the Libreville Declaration and the World Health Organization’s Adaptation to Climate Change in Africa Plan of Action for the Health Sector. To advance national policy processes, key interventions might include health components in National Adaptation Plans as well as specialized assessments of health impacts, vulnerability and adaptation options. Adaptive management could be a viable approach to dealing with the multiple uncertainties and complexities. One promising initiative is the World Health Organization’s collaboration with the Government of Kenya in piloting a multifaceted adaptive management program linking weather forecasting, disease surveillance and response. With the challenges come opportunities for action. In most countries, the immediate health challenges are not new; policies and programs are in place to address them. The challenge at hand is to strengthen planning and policy, scale up existing programs and expand health system capacity. Priority health system actions should include: early warning systems; improved surveillance and data collection; investments in water and sanitation infrastructure; and more research on disease outbreaks, concurrent disease burdens (e.g. diarrheal disease and undernutrition), land use change and drug resistance. Decisions on how to manage the risks of climate variability and change in other sectors – including water, agriculture, energy and infrastructure – have direct consequences for health. Cooperation across sectors is vital to reducing risk. This publication was prepared for the United States Agency for International Development Adaptation, Thought Leadership and Assessments (ATLAS) project by Chemonics International Inc. The authors wish to acknowledge Kristie L. Ebi, Ph.D., MPH, University of Washington, whose research contributed substantially to this report. Read a USAID blog by Colin Quinn "As Cholera Strikes, Climate and Health Integration Take on Urgency in Mozambique"